Last week's Switched On discussed how Lion's feature set could be perceived differently by new users or those coming from an iPad versus those who have used Macs for some time, while a previous Switched On discussed how Microsoft is preparing for a similar transition in Windows 8. Both OS X Lion and Windows 8 seek to mix elements of a tablet UI with elements of a desktop UI or -- putting it another way -- a finger-friendly touch interface with a mouse-driven interface. If Apple and Microsoft could wave a wand and magically have all apps adopt overnight so they could leave a keyboard and mouse behind, they probably would. Since they can't, though, inconsistency prevails. Yet, while the OS X-iOS mashup that is Lion exhibits is share of growing pains, the fall-off effect isn't as pronounced as it appears it will be for Windows 8. The main reasons for this are, in order of increasing importance, legacy, hardware, and Metro. Legacy. Microsoft has an incredibly strong commitment to backward compatibility. As long as Microsoft supports older Windows apps (which will be well into the future), there will be a more pronounced gap between that old user interface and the new. This will likely become more of a difference between Microsoft and Apple over time. For now, however, Apple is also treading lightly, and several of Lion's user interface changes -- including "natural" scrolling directions, Dashboard as a space, and the hiding of the hard drive on the desktop -- can be reversed. Even some of Lion's "full-screen" apps are only a cursor movement away from revealing their menus. Hardware. As Apple continues to keep touchscreens off the Mac, it brings over the look but not the input experience of iPad apps, relying instead on the precision of a mouse or trackpad. Therefore, these Mac apps do not have to embrace finger-friendliness. In contrast, the "tablet" UI of Windows 8 is designed for fingertips and therefore demands a cleaner break with an interface designed for mice (although Microsoft preserves pointer control as well so these apps can be used on PCs without touchscreens). Metro. A late entrant to the gesture-driven touchscreen handset wars, Microsoft sought to differentiate Windows Phone 7 with its panoramic user interface. When Joe Belfiore introduced Windows Phone 7 at Mobile World Congress in 2010, he repeatedly noted that "the phone is not a PC." That's an accurate assessment, and perhaps one worth repeating in light of all the feedback Microsoft ignored over the years in the design of Pocket PC and Windows Mobile. It also of couse holds true beond the user interface for design around context and support of location-based services. But now that the folks in Redmond have created an enjoyable phone interface, have things actually changed? Was it true only that the phone and PC shoud not have the same old Windows interface, or is it also still true that the PC and phone should not have the same new Windows Phone interface? Was it the nature of the user interface itself that was at fault, or the notion of the same user interface across PC and phone regardless of how good it is? There is certainly room for more consistency across PCs, tablets and handsets. However, Microsoft did not just differentiate Windows Phone 7 from iOS and Android, it differentiated it from Windows as well. And that is the main reason why the shift in context between a classic Windows app and a "tablet" Windows 8 app seems more striking at this point than the difference between a classic Mac app and "full screen" Lion app. 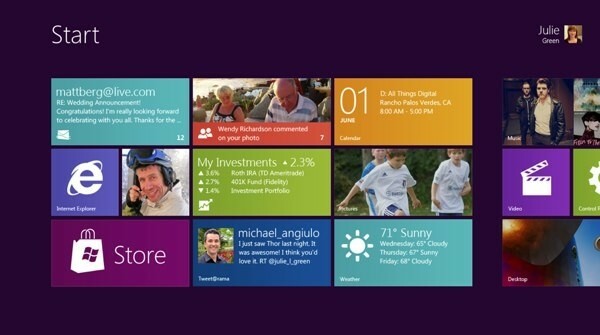 Lion's full-screen apps could be the new point of crossover with Windows 8's "tablet" user interface mode. Based on what we've seen on the handset side, it is certainly possible for developers to write the same apps for the iPhone and Windows Phone 7, but these are generally simpler apps (and then there are games, which generally ignore most user interface conventions anyway). Apple and Microsoft are both clearly striving for a simpler user experience, but Microsoft is also trying to adapt its desktop OS to a new form factor in the process of doing so. The balancing act for both companies will be making their new combinations of software and hardware (from partners in the case of Microsoft) embrace a new generation of users while minimizing alienation for the existing one.